Tory voters supported cuts to public services. Why are they protesting against cuts to their hospital? The ‘red line’ protest at Holsworthy in Devon. How many of these people voted ‘Conservative’ in the 2015 general election? 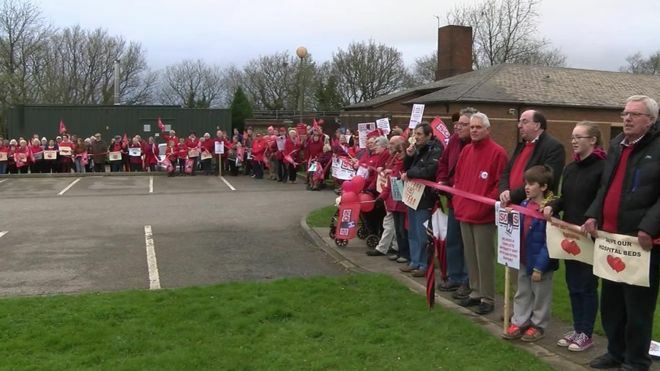 Protesters have formed human “red lines” outside community hospitals in Devon over proposed cuts. At least 10 hospitals across the county have been earmarked for closure, or a reduction in beds or services. The clinical commissioning group (CCG) overseeing the changes, said its aim was to ensure access to “consistently excellent care”. But angry demonstrators said the cuts would “devastate” services and should not go ahead. Save Our Hospital Services organisers said April Fools Day was chosen to protest against the plans because the threat was “no joke”. Protests have taken place in Ilfracombe, Torrington, Bideford, Ottery, Sidmouth, Seaton, Barnstaple, Torbay, South Molton and Exeter. A similar protest took place on Friday in Holsworthy, where overnight services have been temporarily closed due to staff shortages. Normally, This Writer would support anybody in their attempt to keep NHS hospital services open. That’s right – the majority of people in Devon voted Conservative and therefore demanded these cuts. This is what they wanted, right? Or are the protesters all people who didn’t vote Tory. In which case, did they actively campaign against the Tories during the 2015 election, to prevent this from happening? They must all have seen the direction of Conservative policy after the Health and Social Care Act was passed, all those years ago in 2012 – so they can’t use ignorance as an excuse – right? This is a case of self-inflicted harm by the people of Devon. But here’s the thing – as people of conscience, it would be irresponsible of the rest of us to let their NHS services disappear without a fight. If you want help against Tory cuts – stop voting ‘Conservative’ in elections! In fact, if you hadn’t voted Tory last time, you wouldn’t be facing these cuts now. It isn’t rocket science. And, with the local elections taking place next month, you all have an excellent opportunity to get into practice. In general I agree with Clive Peedell and have long gnashed my teeth at people who vote for their own impovershment. However, if you see coverage of the Exeter demo [where I was], you will note the banners of Exeter Labour Party, Exeter Trades Union Council and Exeter Labour Women – all non-Tory voters! Meanwhile, Tories in Devon are running scared both of health cuts and education Mayhem. The Tory County Council even voted against the STP. Without wishing to diminish the outrage against the dismantling of our NHS, I want to emphasise that the ultimate objective of these Tories is to dismantle the whole state and transfer power and wealth into the hands of the few. The NHS is the most visible sign of the Tory mandate, poverty is a political policy they look after the few that profit from the many. Why so many can’t see it is beyond me, but then you have to think first to find out what is actually happening. As others have said before me, it’s far easier to denigrate the weak and needy than to describe how society can work for all. We have been on this trajectory for over forty years now, with Britain’s constant decline, China’s growth rate fell back last year to 6.7% of GDP and they worry about that, we jump for joy when we move into positive figures of 0.3%. People need to understand some simple logic, they make up the real economy, when they stop spending the economy dies, broadly speaking, one persons spending is another’s income. The NHS has already been abolished by the Tories and the private sector is being crudely installed by fragmentation, breaking it up into bite size chunks ready for American health companies to take them over and with it American health Insurance. Jeremy Hunt has already admitted that he has had talks with Kaiser Permanente a ruthless American insurance company more concerned with denying treatment than paying for it. None of this has to be this way, we had a Labour Government after the war that rebuilt the nation with debts of 250% of GDP the current debt ratio stands at 89%, so how could we afford our public services then and not now, the answer is simple, the Tories create the crisis so that they can asset strip state assets, and that is ultimately what this agenda is all about. Your first paragraph “rotzeichen” says it all in a nutshell. The idiocy of people. They were honestly conned into voting Tory, but honestly, I expect come the next time, some of those protesters will vote Tory again. The vote can be misused and people who vote ought to be well informed about their decision anyway. This means they should know about what the government has done and the honesty of the opposition. many Tories want cuts to the services of others, but not to themselves. All part of the hypocrisy of being a Tory. Many people will continue to vote Tory until they’re hit personally. Until then they’ll go on believing that bad things only happen to bad people. Just like the woman who voted for Trump. She is married to an illegal immigrant and was shocked to see him, “a good man who paid his taxes” shoved out of the country. Tory voters support cuts to public services as long as they are “Not In My Back Yard” (NIMBY). As the founding Chair of SOHS, I can tell you that there are certainly no Conservatives among leading activists. Tory Councillors turn up to all the protests involving only their hospital. The real problem are the Lib Dems, who stand as anti-Conservatives during the elections then support the Conservatives when they get elected. There’s a certain weirdness about NHS campaigns across the country. Greens, Corbynite Labour, some Independents, NHA Party, non-party aligned groups and even a few Lib Dems, are fighting for the NHS and putting their local cuts and closures in the context of the Sustainability and Transformation Plans. All those people know this is a deeply political issue and one in which Tory, Coalition Lib Dem and New Labour are deeply compromised. On the other hand there are Tories and their neo-lib friends in the campaigns shouting loudly that this is not the government’s fault (who the hell’s is it then? ), that other campaigners shouldn’t seek to ‘politicise’ the NHS and that the exclusive focus in their area should be on fighting for their local services. These campaigners make much of the ‘support’ they are receiving from their local Tory MPs and local councillors. I’ve even been told Oliver Letwin, one of the prime movers in the privatisation and destruction of the NHS, ‘supports’ the campaign for his local hospital. You really couldn’t make it up. people have become very selfish in recent years, believing the propaganda spewed out by channel five and the right wing press. Only when their own welfare is threatened do they seem to wake up and face reality. I wish these working class Tory voters would remove the blinkers from their eyes. Britain is like a sinking ship sailing on a turbulent ocean be very sure the rich rats will abandon us without a second thought once they have creamed off any remaining wealth. When the tories state that the NHS is safe in their hands to get votes then they should not complain when their Brexit referendum plans fell apart. At last the wake up has started…took a very long time because it has been done covertley and slowly unlike the poll tax decision many moons ago which got instand on the street response to wrong doing and power snatching. This is a sub human globalist agenda which is still ongoing unlike the US where they have woken up to the big picture game plan. Good luck to the protesters, having spent 6 months in a tent on a cold wet field outside Stafford Hospital, or Scandal hit mid staffs as the mass media call it still, we managed to at least prevent them from closing it, although there are many services that need to be repatriated from the PFI, (a labour party imposed building) hospital up the road, because we need the services and for the government to pay the charges not us. Those of us who objected came from labour conservative and ukip parties working together for the good of the local people, so to suggest that it is one sided is not correct. Yes it is one-sided: The TORIES are closing hospitals. Sadly the comments above are right, I recall a disabled friend complaining about the cuts and then voting Tory and going on to support Trump. It simply amazes me the wealthy can convince the majority to vote them into power and then when they make their lives worse continue supporting them. Tory voters don’t organise protests, these people would be from the majority who didn’t vote Tory or didn’t vote at all. Tory voters are selfish sneaky solipsists who couldn’t reach out and hold someone else’s hand unless they themselves were drowning. This article is pretty poorly researched. How can you assume from any of the available information that even a single person attending these protests voted Tory? More than 1million people live in Devon, and only about 40% voted Tory. The people protesting are almost certainly exactly those who have campaigned against the Tories before, and your sowing of division across the country by smearing them is hardly going to motivate them, or help their cause, is it? I can see it now: “Labour Party activist blasts Labour Party protesters”… I usually like your reporting Mike, but of late the aggression seems to have increased and accuracy decreased. You need to read the article before responding to it. See the part that discusses whether the protesters didn’t vote Tory? Note also the tweet that says these communities are “overwhelmingly” Conservative. There is evidence to support everything I stated in the article. I haven’t smeared anyone. Why are you trying to smear me with your last paragraph? The tone of the piece is accusatory. Accusing activists in Devon of not doing their bit to protest against the Tories. Also, a tweet is not sufficient evidence to base an article’s main point on. It took me 5 minutes online to find out the actual voting tendencies in the area. I am not trying to smear you, I support your work. I was merely making an observation, which you can take as you wish. It does appear the Trolls are appearing in number to denigrate social media, I think it is deliberate, anyone that cares about the topics you raise Mike would phrase their language in a tolerant tone, unless they want to just play politics rather than genuine discourse. Those comments are clearly out of order and we should disregard them for what they are, but keep telling them to get lost as any drop of the guard is seen as weakness or worse as though they are right. I was trying to be constructive, and just getting attacked in response. If you hadn’t noticed, the subject is quite an emotive one, one which I feel quite strongly about. Feel free to attempt to stifle reasonable debate, I will carry it out elsewhere. The point is, your comment wasn’t reasonable debate. People are polarised by politics. The terrible Tories are seen by those who dislike having to change their political allegiance as preferable in some unfathomable way to the “fear” of a socialist style Government coming into power and diminishing the value of their houses overnight, raising taxes to provide more Welfare for “benefit scroungers”and generally upsetting the status quo of a currently extremely unfair society. Better the devil you know. Makes me sad rather than angry anymore. Just feel great anxiety for my grandchildren. A thoughtless piece. Many of us live in Tory dominated regions. It doesn’t stop us protesting. It doesn’t stop us campaigning against the proposed closures. The Red Line protests are organised by friends of mine who are left to the core, but they do not stop anybody from participating in them. We have people from all political persuasions taking part and that is a good thing as it puts more pressure on local councillors to do the right thing. What did these people do to get the message out to Tory voters that they were supporting the loss of all these services? What an absolutely vile piece by Mike Sivier. Yes I fundamentally oppose The Tories and their cuts. But to take such schadenfreude in anyone’s loss of services is beyond the pale. We should fight for everyone’s services, irrespective of their political allegiances. Your comment suggests that you didn’t read the piece. I take no joy whatsoever from anyone’s loss of services, as the article makes perfectly clear. I suggest that it isn’t my piece that is “vile”, as you describe it, but the actions of the voters who supported the cuts. What would you do to change their minds? Oh, and if you’re going to respond, make it civil, and make your argument sensible. I just trashed your latest effort because it was neither. My argument was civil. You know that I touched a nerve, and that is why you deleted it. You just cannot be wrong can you? And now I have no proof that I was civil. Surely shutting down debate in such a way is not constructive. Telling me I “fail to understand” the situation, trying to tell me what I think, and referring to my “tiny brain” is not civil, Benji. No – I have proof that you weren’t civil. I shut you down because you weren’t being constructive, but it seems YOU “just cannot be wrong can you”. Because it’s something that affects them, the other things that the tories are cutting, like everything else, mustn’t affect them so that’s why they don’t give a toss of the harm their party is doing to everyone else, selfish, insular right wingers, like I already said, fascists altogether!